Bracket: Add LCDM-W01 Wall Mount Bracket [Add $59.99] Add LCDM-W02 Articulating Arm Wall Mount Bracket [Add $79.99] Do you need a wall bracket? The BNC-22 is a 22 inch LED BNC monitor that is compatible with HD-TVI, HD-CVI, AHD, and analog CCTV cameras (CVBS). This is a security monitor with BNC inputs - one for HD security cameras, and one for analog CCTV cameras. It also has a one HD BNC loop output which can be used to send the video signal from an HD security camera to a second device, such as a surveillance DVR. In addition to the BNC video inputs, the BNC-22 also has one HDMI, one VGA video input, and a 3.5mm audio input that can be used with the built-in speakers. Our BNC monitors include a desk stand for desktop applications. The stand can easily be removed for VESA wall mount installation (VESA 75 mount compatible). Here is a close-up of the video input panel of the monitor. The HD BNC input is compatible with analog CCTV, HD-TVI, HD-CVI, AHD (analog high definition) security cameras. 1080p / 2 megapixel, D1, 960H input resolutions supported. The BNC In on the left can only used for analog CCTV cameras (CVBS / composite). The above image shows an HD security camera connected directly to the monitor's BNC input using an RG59 coax cable. Please note that this is the HD BNC input on the monitor. The HD BNC input is compatible with analog CCTV, HD-TVI, HD-CVI, and AHD security cameras. 1080p / 2 megapixel resolution is supported. The loop output is optional to use. It is used to run the video signal to a second device, such as a video surveillance DVR. The HD BNC input automatically detects the video format and syncs with the BNC loop output. For example, if a 1080p HD-TVI camera is connected, the loop output will also be 1080p HD-TVI format. If the HD input is analog CVBS video, the loop output will also be analog. 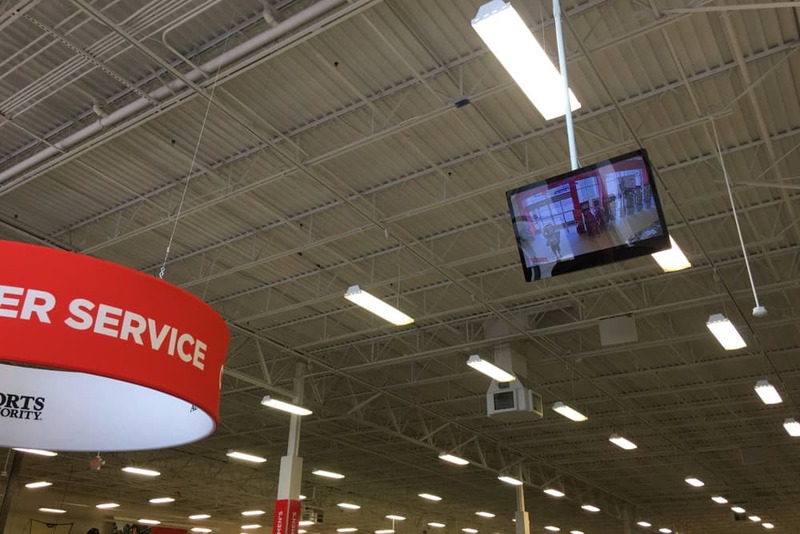 Here is an example the BNC-22 being used as an HD-TVI camera monitor for a live security camera display monitor in a retail store. In this installation, the HD-TVI camera is wired to the HD BNC video input of the monitor using RG59 coax cable. The HD BNC loop output is wired to a surveillance DVR (also with RG59). This allows the camera's video to be displayed live to customers at the retail store entrance and also be recorded on the store's digital video recorder. The BNC-22 can also be used as a CVI monitor or AHD monitor using the same installation described above. The only difference would be that an HD-CVI or AHD security camera would be used. Here is a diagram that shows how to install a live security monitor with a surveillance DVR. The orange and green cable is RG59 coax. The BNC output of the CCTV camera connects to the BNC input of the monitor. The BNC loop output of the monitor connects to one of the BNC inputs on the DVR. Please note that the camera, monitor, and DVR can be very far apart. Also, you can still use the HDMI or VGA video outputs of the DVR to have a display monitor to control the DVR. If you have any questions related to this product or anything else related to security camera systems, please contact us here.